The “Big Idea” of SlideSource is that every slide counts. Every slide represents an investment of time and energy that should be managed throughout the life cycle of the slide. 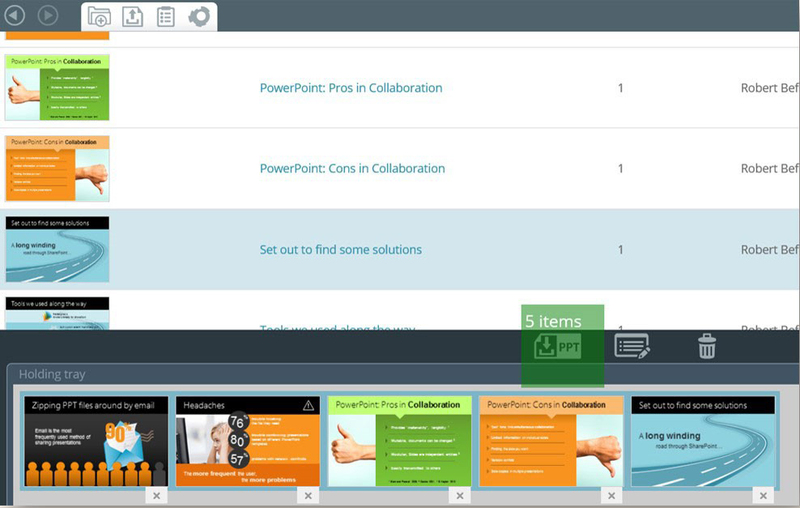 That is why SlideSource enables you to open your slides to edit them in PowerPoint and tracks the version history of both individual slides and presentations. There are times when you will want to edit a batch of slides, or perhaps an entire presentation, offline but still want to maintain the version history of each individual slide in your library. SlideSource was designed with exactly this kind of productivity in mind. This post shows you how to edit offline and then update your library with your offline edits. 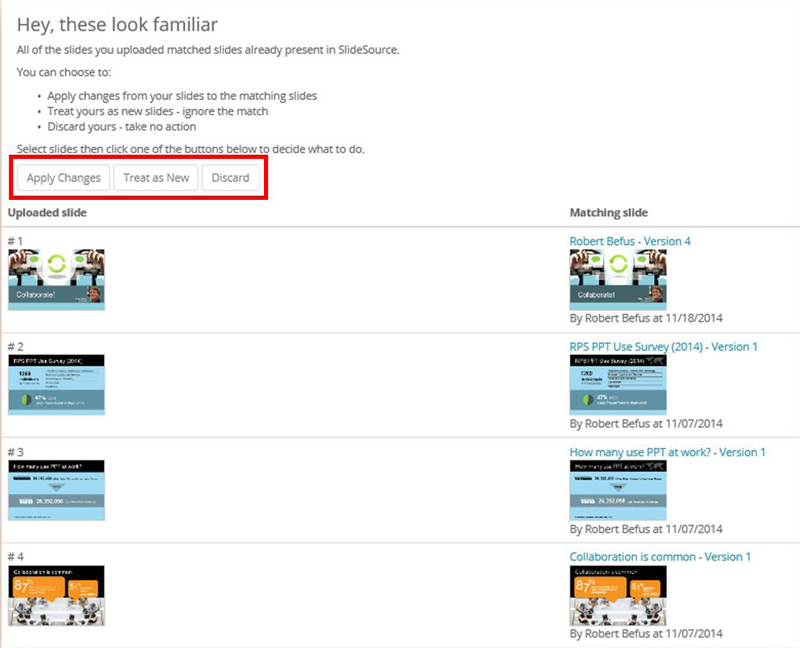 SlideSource can only track version histories for slides that have first been uploaded to your library. 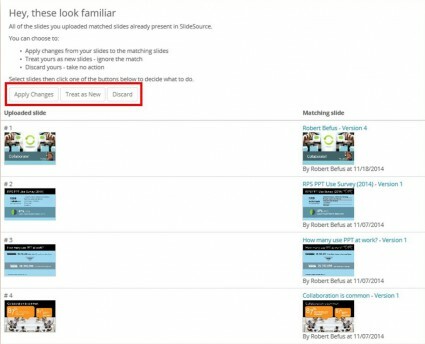 When a slide is uploaded, a unique identifier is added to the slide metadata which will always be used to identify that slide, even if it is downloaded from the site. To edit offline, download some slides by using any of the download options. In the example below, I have temporarily added slides to my slide tray and then dragged them to the PPT button (click image to enlarge). Save the downloaded slides to your computer and open them in PowerPoint to edit as you normally would. When you are ready to update your Library slides with the offline edits, just upload the slides back to SlideSource using any of the upload options. After your slides are uploaded, SlideSource will let you know that it recognizes those slides as ones you already have in your library. You will then be able to decide what you want to do with them. Select each slide (or all slides with Shift+Click) and then click on one of the available actions. If you choose “Apply Changes,” the existing slides in your library will be updated with these new versions and the previous version will be saved to the history. If you choose “Treat as New,” then the slides you selected will be turned into brand new slides in the library with brand new version histories. Of course, if some slides were included by accident in the file, you can choose to discard those slides. It is okay to include edited slides along with new slides in your upload as SlideSource will let you handle each separately. 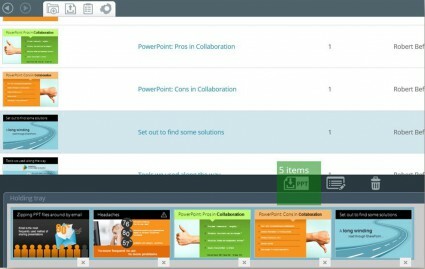 Editing offline can make you and your team very productive without giving up the control of your slides that you have come to expect with SlideSource.com.